Fleas! It’s the dreaded word that all dog owners fear the most. Not only do these pests bother your pup, causing incessant itching and extreme aggravation, but they can also cause problems for you, your family, and any other person (or animal) that comes into contact with your pooch. What’s worse than the irritating itch that these pests cause is that they can also be responsible for a number of other problems; problems that are even more serious than scratches that just can’t seem to be itched. Fleas can carry dangerous bacteria that they can pass onto your dog – or to you! And even if the pests don’t harbor bacteria, their bites can cause such intense itching that your pup (or anyone else, for that matter), can scratch so severely that the skin can break open into wounds. Those wounds can be susceptible to infections, too! All it takes is one flea to cause a massive infestation! While there are tons of flea treatments for dogs, including the standard flea collar and topical solutions, and while many of these options are highly effective, you might want be interested in trying an all-natural approach to flea treatment and control. If so, then you should consider giving essential oils for dog fleas a try. If you aren’t sure what the benefits of these oils are, or you don’t know what type of essential oil for fleas you should use, then you’ve come to the right place! In this review, we offer our top five choices for the very best essential oils for fleas. We also discuss the benefits of this natural approach to flea treatment and control, and share some other invaluable information. But first, let’s take a look at our picks for the best essential oils to get rid of fleas on dogs. Now that you’ve taken a peek at what we consider to be the best essential oils for fleas on dogs, let’s examine each one a little closer. Below, we offer a more detailed look at each option, including their features, what we like best about them, and what other users have to say. After you’ve read through the reviews and chosen the best option for your needs, just click on the buttons to find the best prices on Chewy and Amazon. 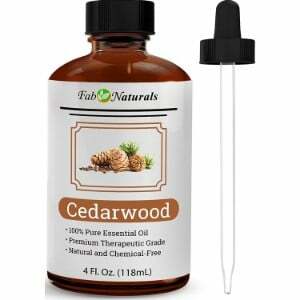 Our first choice for the best essential oil for fleas is Fab Naturals Cedarwood Essential Oil. Fab Naturals is highly regarded for making premium quality essential oils on the market. All of their products are 100 percent pure, and sourced from high quality plants. Their Cedarwood Essential Oil is made from premiums Texas cedarwood. This essential oil is extracted from the cedarwood trees using a process that involves proprietary steam distillation. This process guarantees the purest oil possible to ensure maximum benefits, including scent. What makes this essential oil great for getting rid of fleas? – That’s simple! Fleas can’t stand the smell of cedarwood! But, to dogs and humans, the smell of the oil is quite delightful! So, not only will using this essential oil help to kill and prevent fleas, but it will also make your pup smell wonderful! Additionally, some research success that cedarwood essential oil can also help to promote hair growth, so your dog’s coat may become fuller, too! Final Verdict: We were very impressed by Fab Naturals Cedarwood Essential Oil. The fact that it’s 100 percent natural is a definite plus, and found that it was highly effective. We also found the scent to be very pleasing; however, the sense of smell is unique to each person. Next up on our list of the best essential oils for dog fleas comes from Dr Mercola. Unlike the above product, this isn’t a pure essential oil in the sense that it doesn’t have to be mixed with a carrier oil. That’s because it’s been diluted with pure water. What’s more, it doesn’t offer just one essential oil, but rather several. This mixture is formulated with several essential oils, including cinnamon, lemongrass, sesame, and caster oils, all of which have been sourced from Brazil. All oils are mixed with purified water to ensure safety for your pet. It’s completely free of synthetic ingredients, and is safe to use on a daily basis. It won’t damage furniture or bedding, and it has a lovely scent, too! 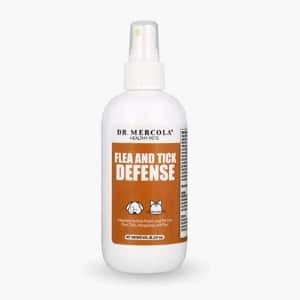 Final Verdict: Just like most users on Amazon, we found that Dr Mercola’s Flea and Tick Defense was highly effective. It not only killed and prevented fleas, but it also kept ticks at bay. The odor is pleasant, and it’s very easy to use (no need for a carrier oil is a definite plus). While some users said that they found it was ineffective, it’s likely that they didn’t follow instructions. This Herbal Flea and Tick Spray for Pets by EnduraPet was created by a veterinarian that practices holistic medicine. It is specially formulated specifically for dogs and cats, so you know that it is safe to use. It’s completely free of harsh chemicals, like so many other flea treatments contain. There are absolutely no pesticides, chemicals, artificial fragrances, or artificial colors. It’s also completely free of alcohol. This natural flea and tick control treatment contains spring water, peppermint, spearmint, lemongrass, clove, cedar, and lemon eucalyptus. All of the ingredients are organic, too! What’s more is that this herbal treatment isn’t just effective for fleas and ticks, but it’s also effective for a variety of other pests, including mosquitoes and mites! The smell is quite pleasant, and some users even say that they use it on their dogs AND themselves! Final Verdict: Our panel of experts found EnduraPet Herbal Flea and Tick Spray for Pets to be very effective. The all natural, organic ingredients are high quality, the smell is lovely, and it appears to be effective. However, if your dog has sensitive skin, you might want to check with your veterinarian before using. Made of all natural, raw, organic ingredients, Sit. Stay. Forever Organic Neem and Essential Oils Tick and Flea Spray for dogs is a great option for pet owners who want to try a homeopathic approach to pest control. Comprised of organic neem oil, coconut oil, organic raw and unfiltered red apple vinegar, rose geranium, grapefruit, sweet orange, Ylang Ylang, and Eucalyptus essential oils, this product offers nothing but natural! There are absolutely no harsh chemicals, including dyes or perfumes, and there aren’t any pesticides, either. In addition to killing and preventing fleas and ticks, this spray also offers anti-fungal and anti-bacterial products, so it really does provide a wealth of benefits for your four-legged family member. It can help to strengthen his immune system and improve the health of his skin and coat, too! The scent is quite pleasing, too! Final Verdict: If you’re looking for a natural flea and tick control product that can also provide several other health benefits, than Sit. Stay. Forever. Organic Neem and Essential Oils Tick and Flea Spray is worth a try. We found that it did offer positive results and that the scent was pleasant. While some users did report that it was ineffective, that’s likely because they didn’t follow the instructions. Also, the sense of smell is very unique to each individual, so it may not be pleasant to all. 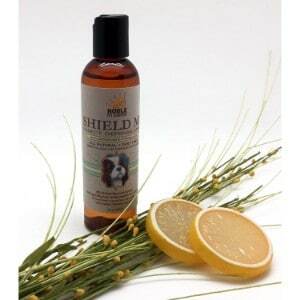 Finally, our last pick for the best essential oil for dog fleas is Noble Pet Shield Me Insect Defense with Essential Oils. Like all of the other products we’ve listed, this is made of natural ingredients that are highly effective for protecting against pests. It’s comprised of citronella, cedarwood, lemongrass, rosemary, geranium, peppermint, orange, and lemon essential oils. Just spritz some on your pooch before he heads outside to keep those pests like fleas, ticks, mosquitoes, black flies, gnats, and bed bugs at bay. This natural pest control spray is non-toxic, so it’s completely safe for your pet. It’s also deet free, and it won’t leave a sticky residue behind. Final Verdict: Noble Pet Shield Me Insect Defense with Essential Oils is a great product if you want to keep pests away using a mostly natural approach. As mentioned, 99 percent of the ingredients are natural, so we can’t say that it’s all natural, which might be a concern for some people. There are so many things that need to be considered when you bring a dog into your home. After all, a dog is more than just a pet; he’s a member of your family! Whether you have a Mastiff, German Shepherd, Corgi, Doberman Pincher, Great Dane, Scottish Terrier, Pug, English Bulldog, or a pure-bred mutt, you want to ensure that you are providing the furriest family member with the best care possible. When you first thought about adopting or purchasing your pooch, you probably put a lot of effort into researching the very best products: a durable dog crate; a comfortable dog bed; a spacious dog house; a secure dog playpen, and a large outdoor dog kennel. And those aren’t the only things that you made sure that had the best of the best of; you likely put a great deal of effort into finding the most comfortable dog collar and dog harness, the best quality dog food to meet your pooch’s nutritional needs (whether it’s dry dog food, wet dog food, senior dog food, or dog food for allergies), and a dog bowl that he can comfortably eat out of. There’s something else that you don’t want to forget about when you’re thinking about the products that your furry friend is going to need; and that’s flea treatment. Those nasty pests can wreck havoc on your pup, your family, and your entire home! While there are a lot of flea treatments on the market, many of them contain harsh chemicals. If you’d prefer to take a natural approach to flea control and prevention, than you might want to consider giving essential oils for fleas a try! You’ve already seen our top picks for the best essential oils for fleas on dogs. In this portion of our review, we’ll dive deeper into natural flea treatment. When it comes to flea control and prevention for dogs, there are dozens of options to choose from. While the highest quality products can be effective, not all of them are. In fact, there have been a lot of complaints lately about how ineffective traditional flea treatments for dogs are becoming. The reason? – Standard options contain chemicals that fleas have actually started to grow immune to. That means that you’ll have to keep on reapplying different treatments in order to see results. Not only can constantly reapplying flea treatments become expensive, but it can also be dangerous for your pup. As mentioned, these products contain chemicals, and those chemicals can be harmful to a dog. This is especially true if your pup is exposed to large amounts. With traditional flea treatments, you are supposed to adhere to the defined timeframe that the manufacturer states. If you apply more product during that time period, your dog could be in serious risk of danger. In other words, if the product you are using isn’t effective, you can’t apply anymore – or any other – product until the time period has passed; unless you want to harm your furry friend – which is the last thing you want to do! This brings us to essential oils for fleas. Unlike the harsh chemicals that traditional flea treatments use, essential oils for fleas on dogs are made of natural ingredients. That means that they won’t harm your pet, no matter how much you apply! That fact, alone, is enough of a reason to give essential oils a try. But, add to that the fact that there are many essential oils that are very successful at preventing fleas and other pests, as well as killing them, and you have a safe and effective remedy for those pesky pests. Treat other pests. Many essential oils are not only effective for killing and preventing fleas, but they can also repel and kill a number of other pests; ticks, black flies, bed bugs, and mosquitoes, for example. Natural deodorizer. Most essential oils have a very pleasant scent, so not only will they kill and prevent pests, but they’ll also make your pup smell nice and fresh. Oils like peppermint, spearmint, eucalyptus, sandalwood, and cedarwood are aromatic and extremely pleasing. Essential oils are highly regarded for their soothing powers. Peppermint, for example, can relieve tension and anxiety. If your pup is anxious, using essential oils on him can treat fleas and calm him down at the same time. Other health benefits. Many essential oils offer a myriad of health benefits. Some can strengthen the immune system, or improve the health of the skin and coat, for example. Treats more than just your pet. Not only can you use essential oils for dog fleas to keep those pests off your pup, but you can also use them to keep those pests off of you – and get them out of your home, too! One of the reasons why getting rid of a flea infestation is because they can easily jump right back onto your pup if they’re still living in your house. You can use essential oils to kill fleas that have taken up residence in your home, and on you, too! Our goal is to provide you with a selection of the very best products for your pups. We know how important your pet is to you; our pets are just as important to us, too! With that said, we wanted to ensure that we chose the best essential oils for fleas possible. In order to do that, we enlisted the help of a panel of experts. Our panel included veterinarians and professional dog groomers, all of whom had experience with using essential oils to kill dog fleas. Once our panel was assembled, we asked them for their recommendations on the best essential oils available. We also scoured the market to and read through countless essential oils for fleas reviews and had our experts assess each of the products, too. After conducting extensive research, testing out the products ourselves, and hearing what our panel had to say, we were able to narrow the field down to a handful of products; the five essential oils for dogs that are featured in this review. Most essential oils are safe to use on dogs; however, there are some that can actually have adverse effects. All of the products featured in this review are completely safe to use on canines; but, if you are going to try your own oils, make sure you consult with your veterinarian first. You don’t want to run the risk of harming your furry friend. Additionally, if you are going to use the products on our list, if your pup has sensitive skin, we recommend checking in with the vet before using. It’s always better to err on the side of caution. Essential oils can be a highly effective, natural way to kill fleas and prevent them from invading your pup in the first place. Depending on the oils you use, they can keep other pests away, too. Furthermore, they can also offer a number of other benefits, such as improved odor, skin and coat health, and even a strengthened immune system. The bottom line: if you want to kill and/or prevent an infestation of fleas on your dog, you might want to consider giving essential oils a try.